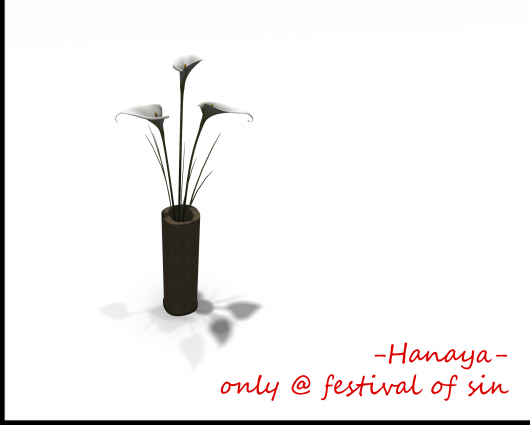 The Back to Black event opened a few hours ago to the public, so this seems like a good time for a final post in our series about -Hanaya- Pine Lake Camping Trip set, our brand new product for the event. Back to Black is an an event organized by CHIC Management with the main purpose of raising awareness of mental health issues. When we were invited, we were given the theme of ‘Family‘. What I immediately thought about was how important it is to have your loved ones around you during troubled times. And I remembered wonderful times with my family in real life – on camping trips. So I made something for you to spend some time interacting with your second life family. All the pieces in the image are included as part of the set. The -Hanaya- Pine Lake Family Camping Trip set includes 8 interactive pieces of camping gear, many of which rez or give props to enhance the camping experience for the whole family. The set is packaged in an autorezzer for easy set up and includes a forest base (shown in the lower set of images). The pieces are also boxed up and provided separately. Instead of telling you about everything it does in words, I invite you to look at the images below, which were taken in Second Life to illustrate some of the fun family activities that are part of this set. A family shot – everyone doing something – playing guitar, roasting marshmallows, cooking and hanging out. The tree has 2 animations for playing hide and go seek, and when you click on it, it emits gentle owl sounds. Both the blanket and the log pile have 2 animations each – sit on the blanket and either sing along or have a little temper tantrum. Or sit on the log pile – chill or read a book. A book is rezzed when you sit. Close up of the bbq table with a portable hibachi and bbq tools. Sit and cycle through the animations. The cooler is fun – 2 animations plus it gives wearable pop that has a open can animation as well as drink. My fave part of the set – both chairs include 2 animations – sit and a guitar is rezzed out in your lap, and a full length song is played. Please let the song pre-load before you listen. Switch to the other animation and be offered a marshmallow on a crooked stick to roast in the fire. The fire itself has awesome sculpted flames – so much better looking that particle fires. Pics above and below show the inside of the tent and the camp cots. Each cot has its own 2 animations – 4 animations in all. The right hand bunk rezzes a book for you to read, or a pillow. The left is perfect for restless sleepers. Lots of tossing and turning. Below is another pic of the chair with guitar – the guitar is gorgeously detailed. It will start to play automatically when you sit in that animation. Afterwards, you can click on it to turn it on and off. It will disappear when you stand up, or switch to the other anim. A final pic showing one of the animations in the cooler. The cooler is modeled after one I had in real life, and comes complete with sculpted melting ice cubes, melted ripply water, and pop cans. For way more detail, please see the preceding blog posts. Or better yet, come and visit the Back to Black event and grab your copy of this set, which is promo priced for the event. The event started today and runs until February 29th. This entry was posted in Events, Product Announcements on February 12, 2012 by moriko. This is the last installment in our Pine Lake Family Camping Trip album. 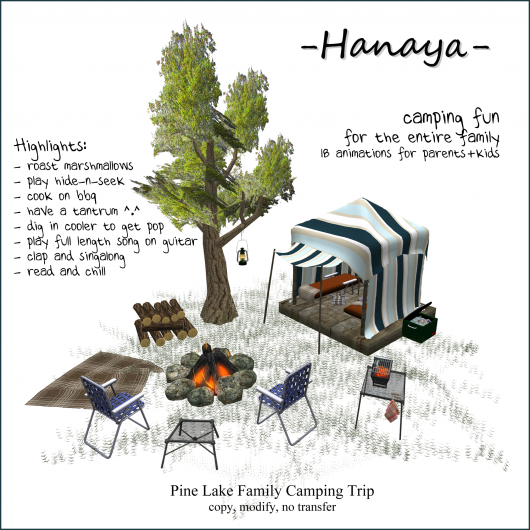 The series of images, designed like pages in a pre-teen’s photo album, were created to illustrate the components of the -Hanaya- Pine Lake Family Camping Trip set. The set is loosely based on my real life camping experiences in wilderness camping areas in eastern Ontario, a beautiful part of Canada. Our tent was generally high tech, very light and we did not sleep on cots. But our gear, even when canoe camping, always included a guitar. When I was first invited to be one of the vendors in CHIC Management’s Back to Black event, and found out my assigned theme was Family, I immediately thought of doing something camping related. That is because most of my happy family memories center around camping. For those of you who have never been on a backwoods camping trip, you just don’t know what you are missing! There is something really special about finding an uninhabited spot of shoreline and making it your home for the weekend. Now that I live in Germany, I miss Canada’s nature very much, and I hope that those of you who have yet to visit Canada will spend at least a small part of your trip exploring nature. In the above photo, our two girls are having a rest inside their tent. 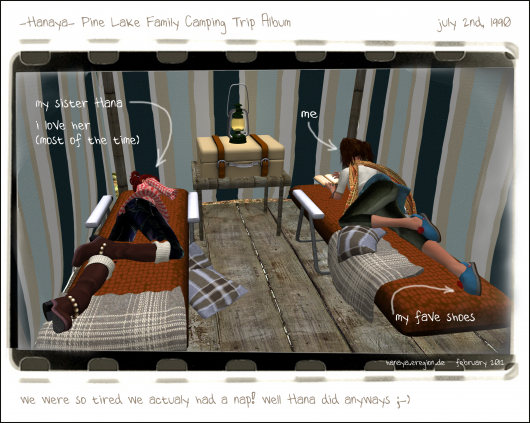 Each bunk has 2 animations, and props are automatically rezzed when you sit/lie down. The cooler also has 2 animations, as well as dispensing cans of pop when clicked. The wearable pop includes a cool ‘open can then drink’ animation, complete with sound and texture change from closed to open can top. Sculpted cans and melting ice cubes add realism and dimension to the cooler. The barbeque table has a cooking and tidying up animation, and gives a spatula and tea towel prop, depending on which animation you are using. Thank you for reading about our latest release, the -Hanaya- Pine Lake Family Camping Trip. We hope you enjoyed seeing the album – it was a fun way to demonstrate all the cool features and animations in the set, and included a bunch of our SL family in the project. Tomorrow’s blog post will give you details about the product itself and tell you a bit more about the Back to Black event. This entry was posted in Events on February 10, 2012 by moriko. One of the things that I really love about getting gifts is really pretty gift wrap. It has been awhile since I released a set of transferable gift boxes – so here are some. Embellished with ribbons, sculpted hearts and roses, they are mod/transfer so you can stuff your own gift inside and give it to your sweetie. Don’t forget that the gift you place inside must also be transfer! The pack comes with 5 yummy colours of box, and there are 2 types of each. 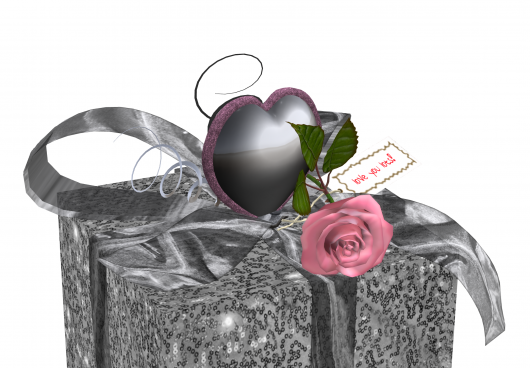 One version includes the gift box with a built-in unwrapping animation and a MESH stool that is worn to open the gift. To use the MESH version, you need to have a viewer that allows you to view mesh (most up-to-date viewers do, including the official Linden Lab one). The non-wearable version is simply rezzed out to open – works with any viewer. 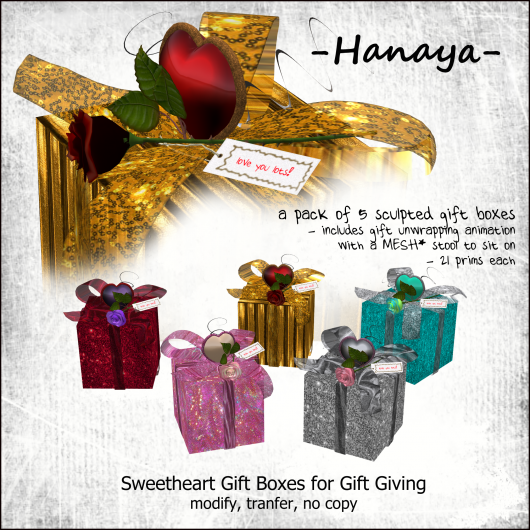 The -Hanaya- Sweetheart Gift Boxes for Gift Giving are available for purchase at our in-world store, as well as on the Second Life Marketplace. If you are a member of the -Hanaya- Yummy Collectibles in-world group, the pink version of the gift box was sent out on the group earlier today. Not a member yet? Join and grab yours from group notices. The group join fee is 250 L.
This entry was posted in Product Announcements on February 9, 2012 by moriko. 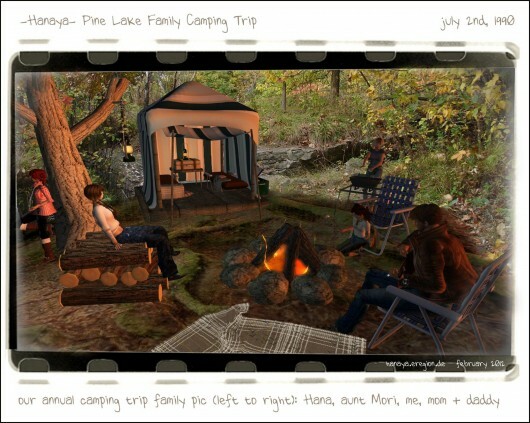 This is the third installment of blog posts based around a camping trip, that took place in real life in 1990, and in Second Life just last week. 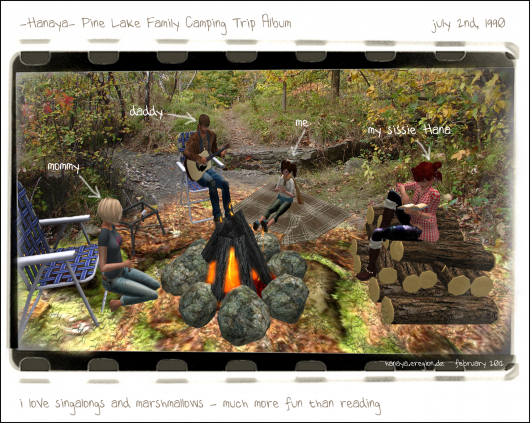 The images represent pages from the photo album of my Second Life niece Miu-chan, and feature furniture and accessories from the soon-to-be-released -Hanaya- Pine Lake Family Camping Trip product. My mom is a really great cook – but she says she prefers our gas barbecue at home to standing over smoking charcoal. Boy, did we get in trouble for leaving the cooler open. Hana and me tried to blame it on racoons, but daddy did not believe us. Later that afternoon, I got daddy to play my favourite Brownie camping songs while Hana and aunt Mori went get more wood for the fire. 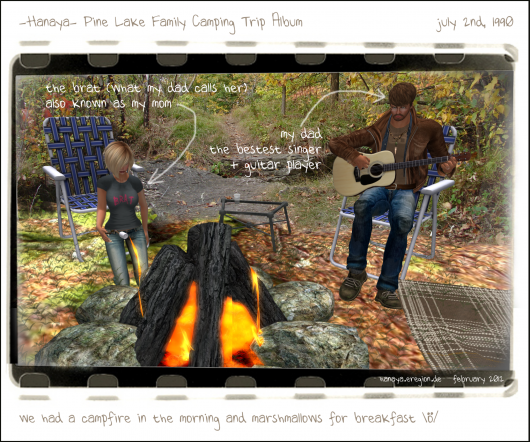 The pages in the album illustrate components of our brand new release, the -Hanaya- Pine Lake Family Camping Trip set, which will be available at a special promo price at the Back to Black event (in the Family section), starting on February 11th. The set includes (but is not limited to) 8 interactive pieces of camping gear, many of which rez or give props to enhance the camping experience for the whole family. For more views of the details of this product, please take a look previous blog posts. This entry was posted in Events on February 8, 2012 by moriko. 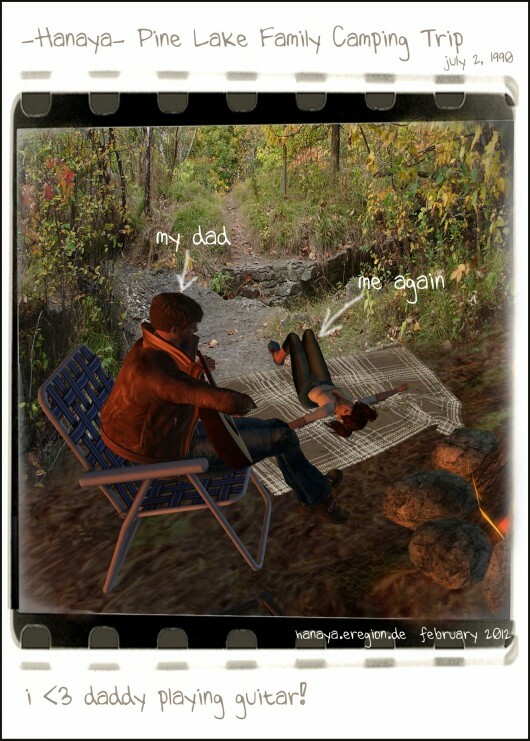 This is a second installment of blog posts based around a camping trip, that took place in real life in 1990, and in Second Life just last week. One of the great things is when we get to play games with my aunt Mori. Here she is sitting on the log pile, while my sister hides behind a tree. I hid in the tent and almost fell asleep! There were all sorts of noises and stuff, so daddy left our lantern on all night. When I woke up in the morning, my pillow was on the floor – again. This entry was posted in Events on February 7, 2012 by moriko. The next series of blog posts are based around a camping trip, that took place in real life in 1990, and in Second Life just last week. Every summer, my mom, dad and my sister Hana go on a family camping trip. It is fun! This year, aunt Mori came with us. Boy was the car ever full!!!! When we got there, daddy made a fire and we sat around roasting marshmallows and sang while my daddy played his guitar. Mommy made yummy stuff to eat. The first morning, we were all up early and went on a long hike in the woods. We didn’t see any bears – phew! Mommy made us more marshmallows and daddy got the guitar out again. Hana hardly played with me, cause she had a new book to read or something. 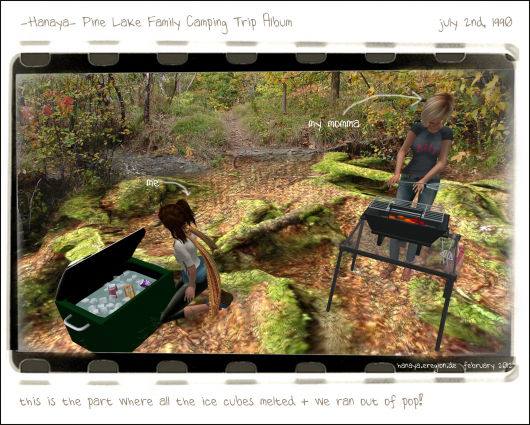 This entry was posted in Events and tagged back to black, camping, Pine Lake on February 6, 2012 by moriko. So here is the gift of flowers that will melt your Valentine’s heart – 12 exquisite sculpted roses and babies breath in 3 styles of bouquet. I hope you and your sweetheart get as much enjoyment out of is as I had in making the piece. Please stop by our in-world store, where it is on display and available for purchase. A copy/modify version is available on request. This entry was posted in Product Announcements on February 3, 2012 by moriko.